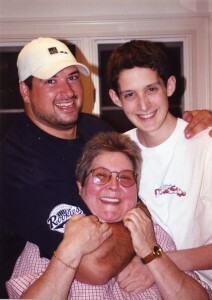 Fifteen years ago, well before the Joe Andruzzi Foundation existed, my husband Joe and I lost a dear friend, CJ Buckley, to brain cancer at the young age of 17. Joe and I first met CJ in 2001, only a month after his diagnosis, at a New England Patriots training camp practice. CJ was a budding sailing star and a big Patriots fan, and in no time Joe and I turned into big fans of CJ. We were immediately in awe of CJ’s positive disposition and infectious smile, and in the months that followed we were blessed to be able to spend many visits with him at home and later in the hospital. In no time the Buckley’s became extended family members to the Andruzzis. Years later, Joe and I named our fifth child “CJ” in his honor – needless to say, we are reminded of his positive spirit each day. In 2003, months after his passing and still reeling from the hole left in our hearts, we wanted to do something to take action. To show our continued love and support for C.J.’s family, Joe and I started the C.J. Buckley Brain Cancer Research Fund at Boston Children’s Hospital. Establishing the Fund, which supports the groundbreaking work of Mark Kieran, M.D., Ph.D., was our way of working towards a time when no child suffers from brain cancer. 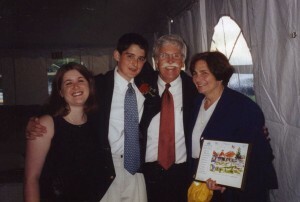 Years later, when Joe was diagnosed in 2007 with non-Hodgkin’s Burkitt’s lymphoma, he immediately started aggressive chemotherapy treatment at the Dana-Farber Cancer Institute and Brigham and Women’s Hospital – fighting the disease with the strength and courage he learned from CJ. Throughout several months of treatment, it was Carter and Lucy Buckley – CJ’s parents (and current honorary JAF Board Members) – who were right there by our side. Later that year, Joe was told that there was no sign of cancer in his body and remains cured today. Our family was given a second lease on life, and Joe and I decided to dedicate our time towards helping less fortunate families battling cancer. In 2008, the Joe Andruzzi Foundation was born, and though we would focus its mission on providing financial assistance to cancer patients, we also decided to adopt the CJ Buckley Brain Cancer Research Fund at Children’s within JAF. To this day, we have continued to support the fund. 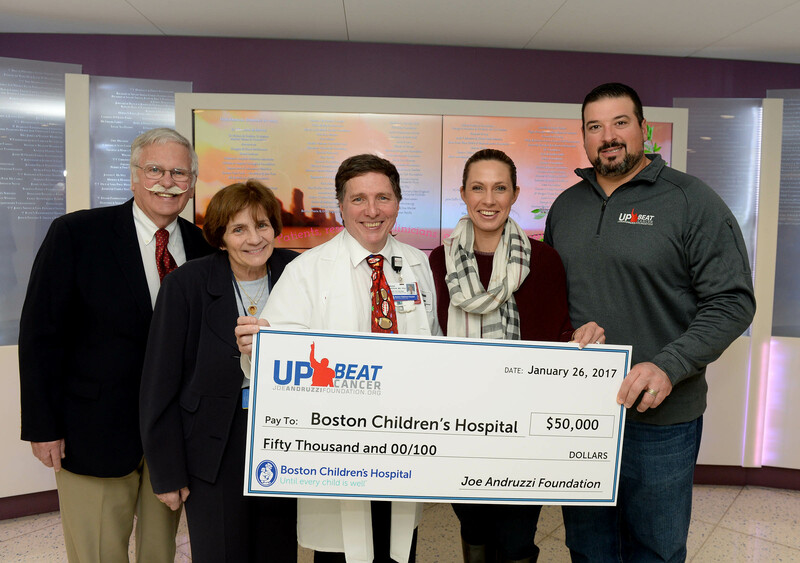 That brings us to present day – last Thursday, actually – when Joe and I had the honor of making the trip into Boston Children’s Hospital for the Joe Andruzzi Foundation’s annual donation to CJ’s research fund. To date, I’m thrilled to say we have contributed $750,000 in CJ’s funds’ name to the essential pediatric brain cancer research Dr. Kieran is leading. The annual visit to Children’s is always such a wonderful day for us; one we look forward to each year. Joining us, as always, were Carter and Lucy, and we had the chance to spend an hour with Dr. Kieran to hear the ways CJ’s fund is empowering him and his staff to continue its revolutionary research. Really, it’s just the Buckley’s and Joe and I sitting around a table with our jaws on the ground, listening in awe to Dr. Kieran infinite wisdom. Selfishly, I could listen to him talk all day about how far brain cancer research has come over the past few decades – in major part due to his efforts, though he is too humble to say that. Afterwards Joe and I had the chance to visit with some young patients at Children’s – it’s heartwarming to see their faces light up when they try on Joe’s four Super Bowl rings. It’s truly amazing how this “State of the Union” type-meeting always leaves us inspired and, most importantly, hopeful about the future of brain cancer treatment, and we can’t thank him enough for everything he is doing to ensure that one day patients like CJ can beat such a horrible disease. We’re just proud to play a role in funding Dr. Kieran’s efforts, and we hope YOU – JAF’s supporters – take pride in empowering us to do so. We all make a great team.